The age of 60 is a milestone, an event to be celebrated and remembered. At this stage in a persons life, they become reflective, having had a career, raised children, and received a lifetime of education, both officially and unofficially. They have a lot to look back upon, and at the same time a lot to share. This wealth of experience and wise perspective can oftentimes make it difficult to know what to get them as a gift. Lets discuss some unique 60th birthday gifts for men. One of the perpetual gift ideas which never seems to age is that of an item which helps the old feel young again - the appeal of nostalgia. A great way to rouse these feelings is to give a gift of candy, which the man ate as a child and during his youth. 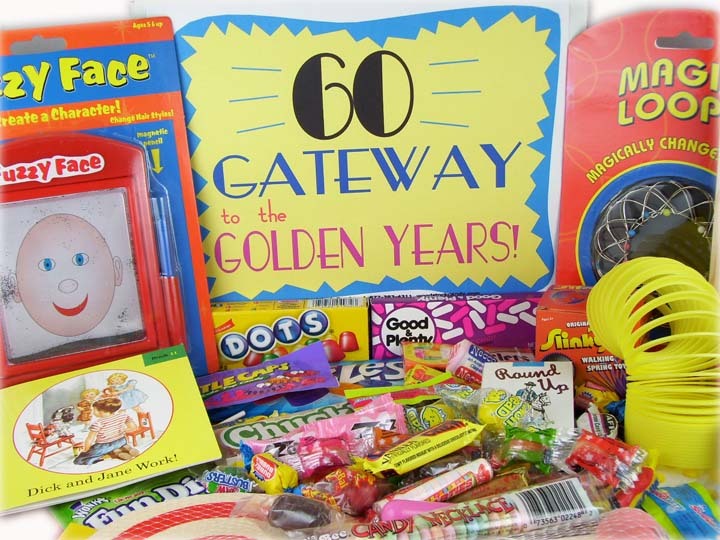 Whether its the delectable Necco Wafers, chewy Chiclets, or the fiery Red Hots, putting a candy associated with their youth in front of them will help them to recall their glory days and will be a gift certain to please. The Internet has brought with it a huge amount of variety and choice when looking for unique 60th birthday gifts for men. With so much to chose from, at least one thing will be found to suit the tastes of whoever you are buying for. Has your perspective receiver always wanted to drive a Ferrari? How about flying a plane? Massages, hot air balloon rides, meeting cheetahs, taking various classes, horse drawn carriage rides, cruises, dinners etc... These ideas have been listed ad infinitum. All it takes is a little knowledge of the recipient, creativity, and rudimentary Internet search skills to make the dream gift a reality. Perhaps an easy way to narrow down which item to choose from among all of the unique 60th birthday gifts for men is to place the man in a category and choose from gifts within it. There are gifts for golfers, gardeners, sports fans, animal lovers, travelers, food lovers, nature lovers, or lovers of anything. A quick search will yield an untold amount of options for someone who falls into any one of these various categories. Whatever the category, there are a few unique gifts which are sure to please someone no matter their tastes. For example you can get a personalized birthday newspaper that will include articles of all the noteworthy events on the day of his birth. Or how about a book where the "story of his lifetime" is filled in with his own hand? A book which chronicles his life; from childhood to child raising, to the grandchildren, from education to career - a gift which will guarantee all the right kind of reflection, not to mention remain a keepsake for the generations to follow. Whoever the man, and whatever the gift sought for him, today's connected world allows us, within minutes to search and find the perfect unique gift for our loved ones who are turning the venerable age of sixty.